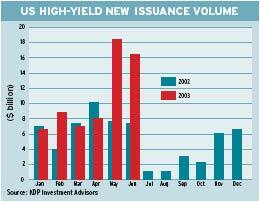 The decline in interest rates to 45-year lows in the first half of 2003 trig-gered a rush of corporate bond issuance that may detract from the volume of new issues in the sec-ond half, analysts say. Most companies already have satisfied their pro-jected refinancing needs for this year, says Richard Salditt, corporate bond strategist at Citigroup in New York. “We do expect supply to trend lower throughout the remainder of the year relative to the blister-ing pace in the first half,” Salditt says. While recent activity in the technology, metals and auto-supply sectors suggests that mergers and acquisitions are beginning to pick up, any bond issuance related to the M&A; business is not expected to affect is-suance volumes to any great extent, he says. Meanwhile, the recent rise in interest rates on signs of a recovery in US economic growth sug-gests that opportunistic refinancing should also begin to slow, Salditt says. Gains in the stock market and expectations of faster economic growth have begun to curb demand for fixed-income investments, but insurance companies and pension funds are still avid buyers of long-dura-tion bonds, analysts say. In the high-yield sector, the improving economy and stronger corporate earnings are helping to strengthen companies’ balance sheets and keep-ing spreads to US Treasury issues narrow. 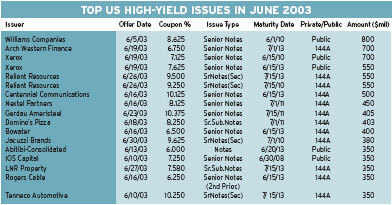 US high-yield new-issuance volume totaled a robust $16.5 billion in June 2003, down only slightly from the record $18.4 billion of new issues a month earlier, according to Vermont-based KDP Investment Advisors. 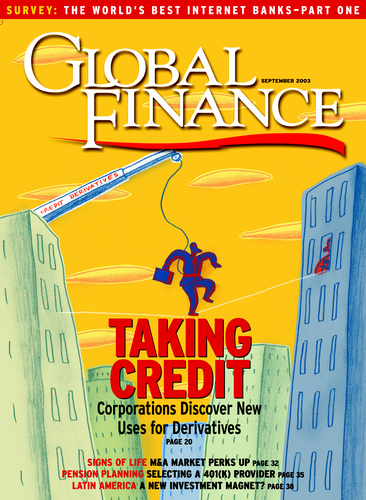 Tulsa, Oklahoma-based Williams Companies, a natural gas utility, offered $800 million of senior unsecured notes in June. The issue was increased from an originally planned $500 million. General Motors’ $17.55 bil-lion multi-currency offering of bonds and convertible securities on June 26 set a record for the largest single fundraising by a company (see story, page 44). The offering surpassed the previous record of $16.4 billion set by France Télécom in March 2001. The previous US record of $11.9 billion for such an offering was set by World-Com in May 2001. Merrill Lynch and Mor-gan Stanley acted as global coordinators for the GM deal, which com-prised $13.55 billion in fixed- and floating-rate bonds in US dollars, euros and British pounds, as well as $4 billion of con-vertible debentures.